Since 1989, we have helped create profitable fudge centers nationwide for a variety of customers including card shops, florists, candy stores, gift shops, farm markets, theme parks, tourist attractions, and many others. Many of our customers used to make their own but have found that the Country Fresh Fudge program has saved them time, labor, extra expense, and has utimately been more profitable. We offer over 100 flavors including sugar-free fudge. 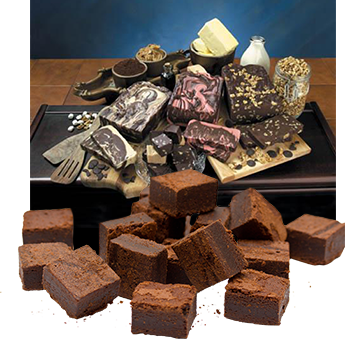 Our bulk fudge comes in 6 LB loaves as well as 2oz pre-cut pieces which require not cutting or weighing by employees. We also offer a unique program for providing display cases. Please contact us and let us explain how we can increase your customer traffic and bottom line with our award-winning fudge.